The Bommer Canyon Community Park Rehabilitation Project focuses on refreshing the former Cattle Camp, originally built in 1967. The 15-acre rustic site is a popular setting for parties, company picnics, weddings, family reunions, and campouts. 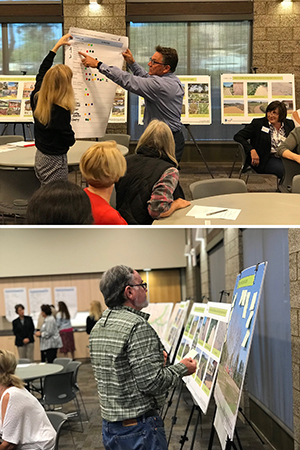 Community feedback on this project received from the City’s public outreach efforts, which included a public workshop in April and an online survey, was incorporated into the rehabilitation design for the Cattle Camp area. Copies of the staff report, proposed plans, and additional project information can be found in the Community Services Commission Agenda for October 3, 2018, here, and at the Community Services Department at City Hall, 1 Civic Center Plaza in Irvine. The City of Irvine Community Services Commission held two public hearings, which included opportunities for public testimony, on the project Wednesday, October 3, and Wednesday, October 17. The proposed plans for Cattle Camp will be presented to City Council during its meeting on Tuesday, November 13. For additional information and more details on this project, read below. Bommer Canyon Community Park is located at 11 Bommer Canyon Road in the heart of the City’s open space preservation area. Built in 1967, then deeded to the City in 1982, the 15-acre community park contains land that once served as a rest area for ranch hands known as the former Cattle Camp. Today, Cattle Camp is one of Irvine’s most popular rental facilities. The site consists of a “Chuck Wagon” food service building, Drink Pavilion, trailer for staff offices, storage units, stage area, picnic tables, fire ring, barbeque spit, and play/activity area. Covered by a lush sycamore canopy, the Cattle Camp provides a unique rustic setting for special events including, but not limited to, parties, company picnics, weddings, family reunions, and campouts. and limited availability due to logistic capabilities and inclement weather. During events, visitors have limited access to minimal on-site portable restroom facilities. In response to these factors, the Cattle Camp quickly emerged as a top priority for a park rehabilitation site in the City. This project will update Cattle Camp facilities to a quality that is reflective of the City’s established standard of care for all Irvine parks.